Thank heaven for AAISP�an ISP that does what it says on the tin! On 3 March, what had seemed a perfect ADSL connection began to fail. Curiously, problems began the afternoon my neighbours� BT line was reconnected. The issue is common enough: intermittent though frequent loss of sync, resulting in the interleaving of my line and an unstable bRAS/ IP Profile. The issue was most obvious when a telephone is in use though sync was also lost at other times. I went though all the usual troubleshooting tricks: use of the test socket behind the master to rule out internal wiring, new micro-filters, more new micro-filters, change of router, use of different computer systems. I moved on to buying new phones, additional surge protectors, and two new routers. A source of the problem did not show up in KBD test results. After five weeks, I half-decided to move to Virgin Media (Cable) but I really didn�t want to sign a year�s contract when I�ll almost certainly not be in the same property next year. (There were other factors.) In the end, I asked my ISP for a MAC. A further week on, migration to AAISP was complete but my line was wretched. Andrew Hearn, a patient soul, dealt with my case from day one. He ran multiple KBD tests in a single afternoon, though they did not provide a clear diagnosis. However, the issue was taken seriously. My connection was monitored 24/7 and it was concluded that there was possibly multiple problems. A BTO engineer called on 21 April. He fitted a new master socket and a new line was cabinet to the exchange. The connection seemed slightly more stable but it was no cure. Andrew Hearn arranged for BTO to carry out a lift and shift on 7 May. Perhaps it was a blessing in disguise that the engineer was a tad confused. He called at the house rather than the exchange and ran though the usual diagnostics. Unlike his colleague diagnosed High Resistance Disconnect fault (HR Dis) at 64 metres. (GeeTee on the BT Wholesale forum was the first to mention this as possibility/likelihood so Kudos to him!) Within five minutes of the BTO guy leaving, he and another engineer were up the pole opposite. The HR Dis was fixed�but still not cure. Andrew Hearn wanted the lift and shift carried out as planned but BT did a Tie and Pair Modification (TPM) instead, which meant some downtime. Since 11 May, four weeks ago, I�ve not had a single disconnection. I am not an important/lucrative business customer but I could not have had better service during this difficult patch if I were. In my experience, AAISP is an ISP not just to try in an emergency but also to stay with as BT technology develops. Thanks, Andrew and all the Team at AA! Thanks for taking the time to write this up, and happy that we got it all fixed for you! EDIT: I've just discovered that a poster called Ardua, to whom I am not "related", has taken a keen interest in my initial post over on another ISP�s group of forums. He queries potential charges for the two BT call-outs arranged by AAISP- not to mention the TPM. This is an issue that, perhaps, I ought to have addressed above. AAISP quoted me the standard BT fee if the fault lay with at my end. (This was onsiderabl less scary than the charges quoted by my last ISP.) However, AA was aware of the extent of the troubleshooting I had carried out in the six weeks before I reached them and following a little extra testing, they were confident that that the fault lay with BT and I would not be charged. I have not paid a penny. This was also the case with the two call-outs I had several years ago with my first broadband ISP. Yes, they've done the same for me in the past too with BT. OpenReach engineers turn up saying "You must have very influential contacts within BT" - When I tell them it's my ISP behind it they cannot believe it as BT never respond like this for an ISP usually. The AAISP forum on here is DEAD for good reason, their products work and the people behind it know what they are doing, know what they are talking about and what a refreshing change that is when you phone them compared to the usual customer support gimps at the average ISP. I am considering a move to AAISP because of what I read on forums such as this. My current ISP states that following BT's decision to withdraw a diagnostic tool called WOOSH the only thing that it has at its disposal is a Keyboard Diagnostic Tool which carries out a simple PASS/FAIL line test. I am therefore not sure what premium support I am paying for. The only thing stopping me from asking for a MAC is AAISP's rather complex charging system which I confess I do not fully understand. I tend to use the internet throughout the day - using about 20 to 25GB of a 40GB peak download per month (9am to midnight is treated as peak). I rarely use IPlayer and do not game. Is AAISP the right ISP for someone like me? Sounds like they might not be the right ISP for you as it seems you use a lot of peak bandwidth. I'll try and briefly explain how their charging works. They give you 2 units of bandwidth per month (you can set this to more if required). This is £6 a month (ex vat). This usage is then used differently depending on the time of day you use it (they only meter downloaded traffic, not uploaded). So if you use 10Gb peak, that's 10/2 = 5 units. 10Gb during off peak would be 10/100 = 0.1 units. 10Gb during night time special would be 10/1000 = 0.01 units. Ontop of the bandwidth units, there is a base charge for the broadband connection, currently £10.17 ex vat per month for a 21CN connection. And if you are doing the line rental through them, that's another £10 a month, ex vat. So for me, total is: (10+10.17+6)*1.2 = £31.40 per month (inc vat). If you are keeping the line rental with BT, it would only be £19.40 per month (inc vat). They also role over unused bandwidth units each month, up to a maximum of the base amount you've asked for. For example, at the start of this month, I actually had 4 units to use, as I had a quiet month last month and didn't use my connection much. They also role the other way too, so I believe you can go over your base usage for 1 month and not be charged extra. If you do go over your base usage for the 2nd month running, they then charge at a marginally more expensive rate for the number of units you've gone over (if you keep going over usage, it's advisable to up the base usage of 2 units to something higher that matches your 'normal' usage amount). At 2Gb/unit during peak time, that is easily eaten up if watching video/downloading - I've noticed I can eat through that very easily if I'm at home during week days. Sounds like this would happen with you, so I would suggest looking at alternative ISPs which allow more peak time traffic per month, and who more closely fit your requirements. Thank you Mixt: your response is extremely helpful. I confess that I am looking at AAISP because of their line monitoring software. I have issues with random ADSL 2+ disconnects which I believe are line quality related. I have done all the usual things that ISPs recommend but the disconnects still occur. I may just sit back and wait for FTTC. I would try making sure interleaving is on for a start. Then, identify when noise is present most on your line (this is normally the evenings) and then reboot/sync your modem at this time. It will then negotiate a sync speed which (hopefully) is the worst possible speed you are likely to get. So over 24 hours, it shouldn't get any worse, and should hold sync. If you are still having problems after that, something else probably needs looking into. I would suggest getting the target SNR changed on your line, but I don't think BT allows ISPs to do that. I have been advised on here that on a 20CN connection the lowest SNR the BT DLM will push your modem to is 6db. On 21CN connections, this is even lower, at 3db. If you are syncing with a 3db noise margine, it maybe your line is just too noisy to reliably support this SNR. I always preferred BE in this respect, as they allow their users to set profiles of 3, 6 or 9db on their lines (and higher by calling tech support). This allows users to use human intervention to choose the most stable settings for their line, rather than letting BT's DLM decide instead, and getting it wrong (more often than not). Also, some routers are very feature rich and allow you to force sync at a certain SNR, independent of what ever the ISP has set (I used this feature years ago when on a BT 20CN (ADSL1) connection using a DrakTek 2600, now very much old school). As for AA line monitoring, yes, their system is very good. They send LCP ping packets every second to your router and graph the latency/loss. So both you and them always have a full record of what the line is doing, allowing them to very easily employ this information when opening a fault with BT. Very handy indeed. I think the issue is slightly more complex. It the weather remains cool and damp and the phone doesn't ring, my router can hold synch for days. However, when the outside air temp increases then the router shows a high error rate whenever there is an incoming call - particularly, if it hasn't rained for a few days. Often this results in a loss of ADSL and re-synchronization. I just thought that AAISP's line monitoring might provide me with more information than I can get out of my present ISP. At the moment, I fear that if I asked for an Openreach visit, they would be looking at an open goal and a charge that I would have to pay is almost guaranteed. 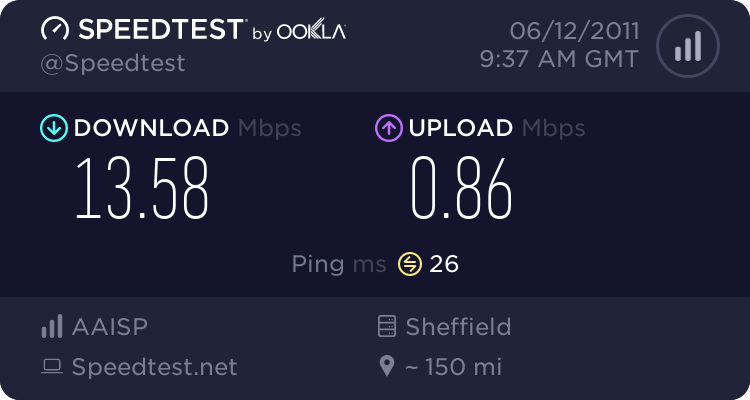 That is why I am now beginning to think that FTTC might be my best hope as AAISp's packages do not suit my usage pattern. FTTC should be available in my area towards the end of the year.